Gov. Chris Christie wants a longtime New Jersey eyesore to get a makeover. Calling it the ugliest building in New Jersey, and possibly America, Christie said Thursday that any deal to finish developing a troubled multi-billion dollar retail and entertainment complex at the Meadowlands will have to include a new exterior. Late last year, Triple Five, which owns the Mall of America in Minnesota and the West Edmonton Mall in Canada, signed a letter of intent with the lenders of the Xanadu complex to complete the development and possibly expand it. 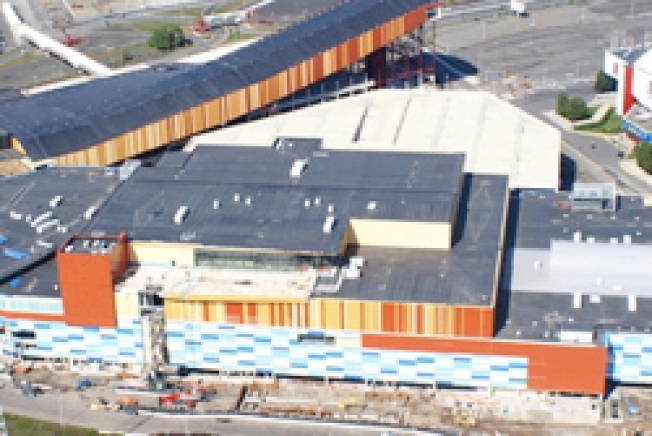 Located about 10 miles west of New York City, next to the Izod Center and across a highway from the $1.6 billion New Meadowlands Stadium that is slated to host the 2014 Super Bowl, the decor of the complex has been a source of curiosity for motorists traveling the New Jersey Turnpike. At a town hall event Thursday, Christie said the first thing that must be done is change the multicolored, multi-patterned exterior. "They have to change the God-awful ugly outside of that building. It is just an offense to the eyes as you drive up the turnpike," Christie told the crowd, which responded with a cheer. The decor, which cost an estimated $40 million, has been a source of curiosity for motorists on the turnpike and a joke for late-night comedians. Christie said the exterior was a reminder of the project's failure, asking: "How didn't everybody understand that something that ugly would fail?" The project has had more than just cosmetic problems. The sprawling $2 billion complex originally was projected to open in late 2007. It was supposed to feature shops, an indoor snow dome, a movie complex, bowling alley, restaurants and an upscale martini bar. But as financing fell through, it remained empty, with its most noticeable feature being its exterior. Creditors took over Xanadu in August, after original lead developer Mills Corp. ran into financial problems and was replaced as general managing partner in early 2007 by Los Angeles-based Colony Capital Acquisitions. Triple Five and the governor's office are in negotiations to start development, and a possible expansion. Christie said he hopes to have an announcement on the project this spring. Christie has backed findings of a panel studying the state's gaming, sports and entertainment industries that recommended the state commit $875 million to help finish Xanadu. But, on Thursday the governor said there would be a caveat to using any state money on the project -- the state wants a piece of the equity. "If they want a state investment, we get a piece of the action," Christie said. Bloomfield resident Charles Thompson, who came to the town hall event, said he didn't agree with Christie on a lot of things, but was thrilled to hear him mention that Xanadu was getting a makeover. "He's right about that," said the 58-year-old Thompson. "Paint it white, or black, just do something!" Christie promised that the exterior would be the first thing worked on, even if construction inside remains unfinished. "I can't take it anymore," Christie said, "and neither can the people of New Jersey."